DogFence containment Fences are designed to keep your pet safe. A dog fence will give your pets freedom while keeping them happy and safe in their own garden. Our DogFences are manufactured by DogWatch hidden fences and we represent them across the UK and some parts of Europe. You can also use a containment fence fence to designate areas that are “off-limits” such as flowerbeds, a gated driveway, kids play area, swimming pool, or a BBQ area. Our hidden dog fences are similar to old AM frequency Freedom Fences but use the latest and safest FM Safelink technology. Our containment fence also gives great peace-of-mind to you, the loving owner. You will be able to rest assured that your pet is safe. No more worrying about them running off or getting into the road. With a DogFence system, you get all the benefits of leaving them to roam without the worry. We have solutions for all types and sizes of areas, from a small garden right up to a 200 acre estate. There are also very few places where we can’t install a dog fence. We can go under pathways and patios, or even over rivers and through woods! Unlike the old AM Freedom Fences our systems are not affected by signal loss from underground pipes or wires and can even be attached to existing metal or stock fences. Containment fences work well for cats too! Our DogFence hidden fence system works well as a cat fence, too. If you wish to install a containment fence to keep your cat or cats safe our dedicated CatFence web site has lots of information and advice. But what if you have a dog and a cat? No problem. You can use a DogFence hidden fence as a cat fence and a dog fence at the same time. And if you have several dogs and cats? No problem. 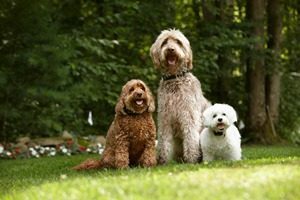 Our hidden fence systems can handle multiple pets. And since no two pets are alike, the collar settings can be individually adjusted to suit the breed, size, age and temperament of each dog and/or cat on the system. 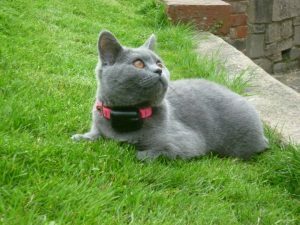 Our fences come with a choice of computer collars (standard or mini) as we recognise that pets are not a one size fits all. The fence uses a small transmitter to a signal around the boundary. The containment fence transmitter controls the coded FM radio signal in the buried wire, providing fast, clear, signals. In addition to being the only FM transmitter available for containment fences, the DogFence transmitter is fully adjustable by the end-user to suit your needs. This means that you can increase or decrease the size of the @no go zone” in comparison to the size of your property or breed of dog or cat. You won’t find anything quite like it in other brands. The old generation of fences; Freedom Fences & PetSafe all still use AM frequency transmitters. Our latest product use wifi connectivity. The Smart Fence is the first fence worldwide to offer features a 2 way communication so that you can even monitor your dogs activity during the day! 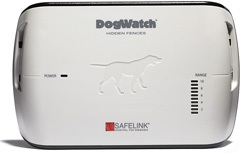 Learn more about the features of the Dogwatch system. DogFence receiver collars are the smallest & lightest available worldwide. Our compact Micro receivers in the R12m and R7m weigh in at only 30g and offer a 6 month battery life which is twice as long as Freedom Fence and longer still than many other brands. However, when it comes to our standard collars there is no beating the R12 & R9 DogFence collars. 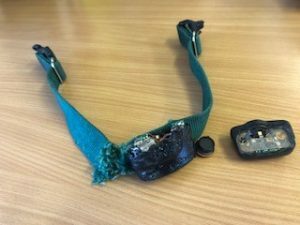 These collars are suitable for medium – large breeds and offer a whopping 2 year battery life but still in a compact and durable lightweight case (48g – as against 58g with Freedom Fence and PetSafe collars)!!!! One of the keys to the success of a containment fence is consistency. The longer the battery life the less likely the dog or cat is to run out. Every receiver has 3 omni directional antenna (x, y & z axis) to guarantee that the receiver collar will activate at any angle. Each receiver is individually constructed and tested by hand to ensure consistency and quality. All our receivers are warranted against dog chews and our professionally installed systems also come with a lifetime warranty. No other Containment Fence Company can match our warranty. The DogFence receiver collars are also available with a new generation of contact posts. Unlike Freedom Fence and other brands if you have a short or smooth coated pet you no longer need to use the old steel contact posts. DogFence containment fence collars come with the option of the “Comfort Contact” posts a conductive plastic probe. This new generation of fence probe is unique to DogFence containment fences.